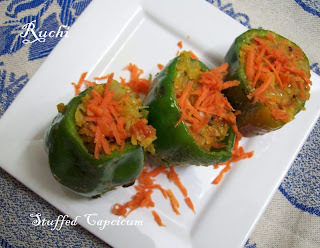 From long time I always wanted to make stuffed capsicum. I wanted to give it a try for this recipe and browsed to get the idea, lot of people made the stuffing with lot of ways .I got this recipe from here by Chef Aditya Bal.I felt it simple and it turned out good. Slice off the top of the capsicums. Scoop out the inside keeping them hollow. Heat 1 tsp of oil in a pan; add the mustard seeds, allowing them to splutter. Add the cabbage and carrots and mix well. Sprinkle the turmeric powder, salt, coriander and red chili powder and mix again. Cover and let this mixture cook in its steam for five minutes. Now stuff the capsicums with the mixture and fry them in one tbsp of oil. Cover and simmer for 10-12 minutes till the capsicums become tender. Looks very inviting and delicious. Hey...i love this recipe for stuffing..healthy, light & no aloo!! Wow,yummy,never tried this so far! I cant imagine stuffed capsis without aloo, quite interesting and delicious akka..